What rising bond yields imply for Indian equity markets? However, most of that was negated as the bond yields once again moved up once it became evident that the undertone was hawkish on rates. This was also confirmed by the minutes of the Monetary Policy Committee. The big news in the Indian bond markets has been a rise in bond yields since June 2017. In fact, post the April monetary policy, there was a sharp fall in bond yields after a slightly dovish stand. However, most of that was negated as the bond yields once again moved up once it became evident that the undertone was hawkish on rates. This was also confirmed by the minutes of the Monetary Policy Committee. From a low of around 6.5% in June 2017, the 10-year bond yields have gone up by over 120bps. This has been driven by three essential factors. Firstly, the domestic inflation (especially food inflation) has been on an uptrend after the 2017 Kharif output was lower than expectations. Higher crude oil prices have added to this concern. Secondly, the 30bps spillage in fiscal deficit in the Union Budget 2018 also means that government will have to borrow more at higher yields. Thirdly, global yields across the US, Europe and even Japan have shown a rising trend as these economies are seeing the return of inflation. Let us talk about inflation expectations. With the government fixing MSP at 150% of cost of production, food inflation will remain high this year. Brent Crude is already at $75/bbl and this could also push inflation and yields higher. What does this mean for equity markets? One may wonder how bond yields will impact equity valuations. Let us go back to how equities are valued. The future cash flows of the company are projected and then they are discounted back to present value. When you value the company as a whole, the cash flows are discounted by the average cost of capital (average cost of equity + average cost of debt). If the bond yields go up, then the average cost of debt goes up and so the average cost of capital also goes up. That means future cash flows will be discounted at a higher rate and that will imply lower valuations for equities. Firstly, the equity investor at least needs to earn the risk-free rate on a government bond. Secondly, the investor needs to earn what the passive index (Nifty or Sensex) can earn. Thirdly, the investor will need compensation for taking on the company macro risk, which is measured by Beta. Finally, the investor will also need compensation for residual risks that are unique to the company. Now, when the bond yields go up, then the Rf goes up and hence equity investors will demand higher returns. If they are not able to earn higher returns, the stock price will correct. That is not great news for equities. We have not seen this in a long time as equity continued to be attractive via-a-vis debt. 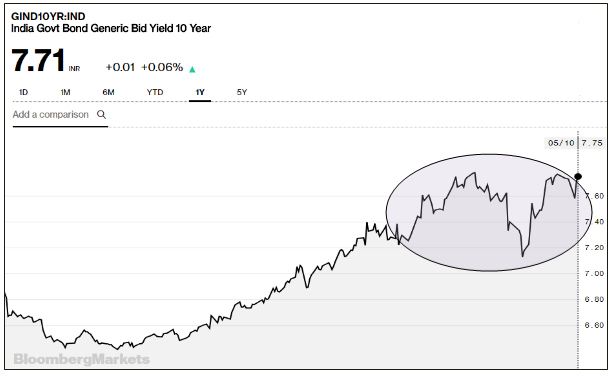 But if bond yields go higher and equity earnings yields don’t match up, then investors will find it more lucrative to be invested in debt rather than in equities. For example, if the P/E is 20, that means the earnings yield (E/P) is 5%. If bonds are giving a current yield of 8% (quite close by), then long term investors will have an incentive to shift from equity to debt. This is truer in case of large institutional investors like FIIs and mutual funds. Recently, Reliance Industries raised short term funding at almost 100bps above the level they had raised one year ago. If a blue-chip company like RIL is facing higher borrowing costs, the problem could be a lot more acute for companies with lesser financial muscle, especially mid-cap companies. Higher borrowing costs could put a real strain on the financial risk of companies. Higher interest cost will mean lower interest coverage and that is an indicator of higher financial risk. Finally, banks and mutual funds holding bonds in their portfolios will also face investment depreciation due to higher bond yields. The only positive feature is that in the longer run, equities have gained from higher yields if it is supported by GDP growth. But for that we will have to wait for more confirmation from GDP numbers.